A field of grapes grows in Elgin, Ariz., on Sept. 30. 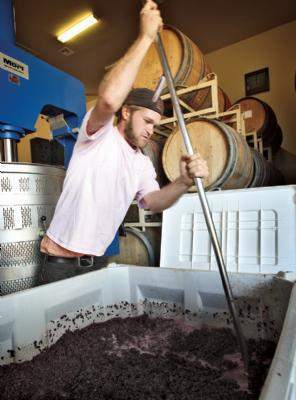 Below: Kief Joshua Manning stirs grapes during the fermentation process at his winery in Elgin on Sept. 30. 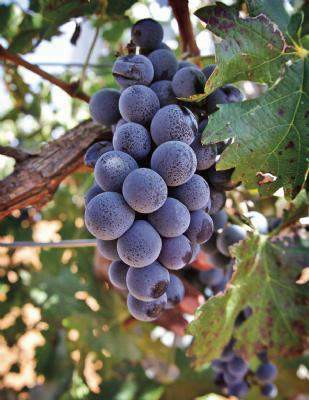 ELGIN, Ariz. – Grapes aren’t supposed to grow in the desert. But here in this southern Arizona town, surrounded by endless, rolling green and amber hills, the Callaghan family is de-stemming gigantic bins of grapes that eventually will produce a nice Petit Verdot. degree fall weather, as one of his workers, Megan Haller, sifts through bunches of grapes. “You can actually have some excellent wines out of Arizona. It can be done,” said Haller, who works at Callaghan Vineyards while taking winemaking classes. 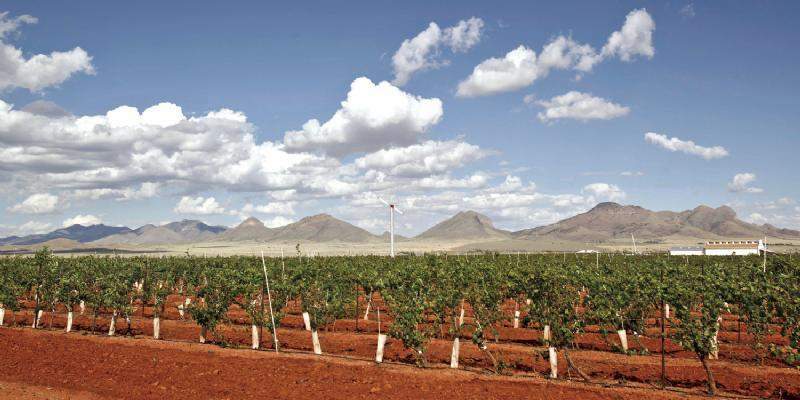 The 25-acre vineyard was one of three in Sonoita-Elgin, a rural area an hour’s drive from Tucson, when Callaghan’s parents started it in 1990. In the last decade, six other vineyards have moved in. Similar growth also has occurred in northern Arizona as more aspiring winemakers saw the time was right and land was ripe for the taking. The ensuing clusters of vineyards have created a wine drinker’s treasure map that has gone unnoticed by many – even Arizonans. Talking with tourists who are surprised at the availability and quality of Arizona wine is almost a daily routine for vineyard owners. “It happens all the time, especially among people who know wine well. People really into wine are totally off the beaten path here,” Callaghan said. Besides Sonoita-Elgin, Arizona wineries have flourished south of Sedona in the Verde Valley, situated along the Verde River, and around the southeastern city of Willcox. All three areas are nestled at elevation levels between 4,000 and 5,000 feet. The location leads to cooler summers and low evening temperatures. “That’s what the grapes really thrive in. It thickens their skin. It contributes more flavor to the wine,” said Rhonni Boss-Moffitt, publisher of Arizona Vines and Wines magazine. According to Boss-Moffitt, there are 39 licensed wineries across the state. There is a competitive but also neighborly spirit among the wineries – most of which are boutique, family-run businesses. At an Arizona winery, a visitor has a good chance of actually being served by the winemaker. That atmosphere is what drew Tim Mueller and his wife, Joan, to open Canelo Hills Winery next door to Callaghan in 2005. Transplants from Rhode Island, they thought Sonoita-Elgin was reminiscent of what Napa, Calif., was 35 years ago. Between tourists and snowbirds, a majority of tasting rooms see the most traffic October through April. “Our busiest day of the year is actually the Friday after Thanksgiving. We probably see about 200 people,” said Kief Joshua Manning, who runs Kief-Joshua Vineyards on the same road as Callaghan and Canelo Hills. Manning has been operating his winery for only two years. He thinks being around several other vineyards is better for everyone’s business. “It gives people more of an excuse to come down when there’s more wineries to hit as opposed to spending more time driving than tasting,” Manning said. Elgin wineries will offer a reduced tasting price if patrons have a wine glass purchased from another winery. Out-of-state promotion is something winery owners and their surrounding communities continue to consider. The town of Cottonwood, in the center of Verde Valley, is trying to entice vacationers by packaging and branding the wineries as the Verde Valley Wine Trail. Thanks to a grant from the state’s tourism office, the city has set up a Web site offering an event calendar, a printable map and even a photo contest. For those visiting any of the wine regions sans car, there are numerous local wine tours. Some incorporate the natural landscape. In Sedona, where jeep tours are practically a rite of passage, some include winery stops. The area also allows for an itinerary of sipping wine before or after hiking or kayaking. Tina Gibson of Phoenix became such a big advocate of Arizona wines that she and her family started their own tour, Arizona Grape Escapes. Cottonwood, Ariz., about 50 miles from Flagstaff. ► Arizona Grape Escapes Tour: www.arizonagrapeescapes.com or (602) 368-3619. Daylong tour from Phoenix to four wineries in northern Arizona; offered most weekends, $150 per person including picnic lunch. 11 a.m.- 3 p.m. Wine tastings are $7, which includes a 21-ounce glass ($4 if you bring your own glass). ► Canelo Hills Winery: Elgin, Ariz.; www.canelohillswinery.com or (520) 455-5499. Open Friday-Sunday, 11 a.m.-4 p.m. Wine tastings are $5, including a souvenir glass ($3 with your own glass). 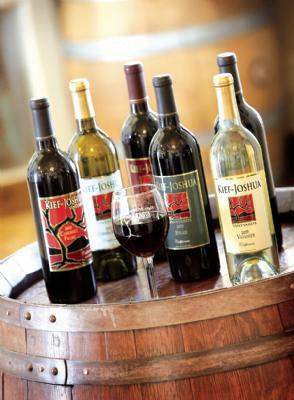 ► Kief-Joshua Vineyards: Elgin, Ariz.; www.kiefjoshuavineyards.com or (520) 455-5582. Open daily 11 a.m.-5 p.m. Wine tastings are $5 for six wines, including a souvenir glass ($3 with your own glass).